Just how Hyde drew it up! Tony has owned and operated Orioles Hangout since 1996 and is well known for his knowledge of the Baltimore Orioles organization from top to bottom. He's a frequent guest on Baltimore-area sports radio stations and can be heard regularly on the 105.7 FM The Fan. 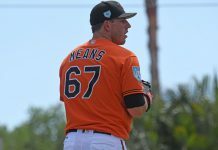 His knowledge and contacts within the Orioles minor league system and the major league baseball scouting industry is unparalleled in the Baltimore media and is known as an expert on the Orioles prospects. OriolesHangout.com is an unofficial site and not associated with the Baltimore Orioles and part of Hangout Ventures LLC.